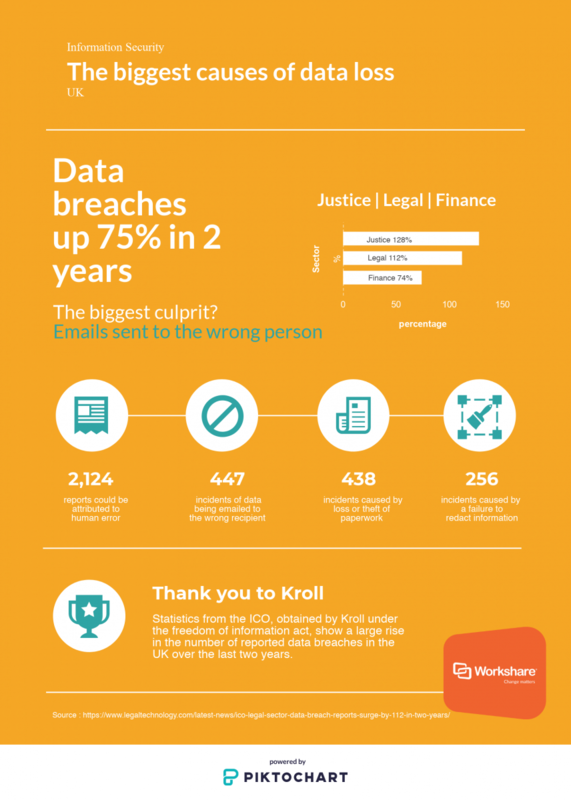 Through statistics obtained by Kroll from the Information Commissioners Office, Workshare looks at the biggest causes of reported data loss to businesses in the UK. The fear of cyber attacks may be high and information security risk rising all the time, but the real danger comes from simple human error. And, more importantly from individuals emailing data to the wrong person. Misaddressed emails, with data inappropriately shared, is still the number 1 cause of data loss in UK firms. It's easily done and has created 447 data breaches that were serious enough to need reporting to the ICO. While unauthorized accessing of information, phishing attacks and the use of other malware are rising causes of data loss, they seem to pale when compared with simply completing the wrong name in the To field of an everyday email. The stats also reveal the volume of increase in data breaches by sector over the last two years. It highlights the need for more companies across different industries to take action to prevent accidental data loss. The steps needed include blocking emails addressed to inappropriate recipients and removing sensitive or confidential metadata contained within files before they are shared over email.